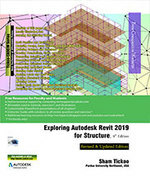 Exploring Autodesk Revit 2019 for Structure is a comprehensive book that has been written to cater to the needs of the students and the professionals who are involved in the AEC profession. This textbook enables the users to harness the power of BIM with Autodesk Revit 2019 for Structure for their specific use. In this textbook, the author emphasizes on physical modeling, analytical modeling, rebar modeling, steel element cutting tools, structural steel connections and quantity scheduling. Also, Revit 2019 for Structure book covers the description of various stages involved in analyzing the model in Robot Structural Analysis software. This textbook is specially meant for professionals and students in structural engineering, civil engineering, and allied fields in the building industry. In this book, along with the main text, the chapters have been punctuated with tips and notes to give additional information on the concept, thereby enabling you to create your own innovative project.